Patient with refractory seizure may undergo awake craniotomy when the area to be resected is immediately adjacent to eloquent cortex. 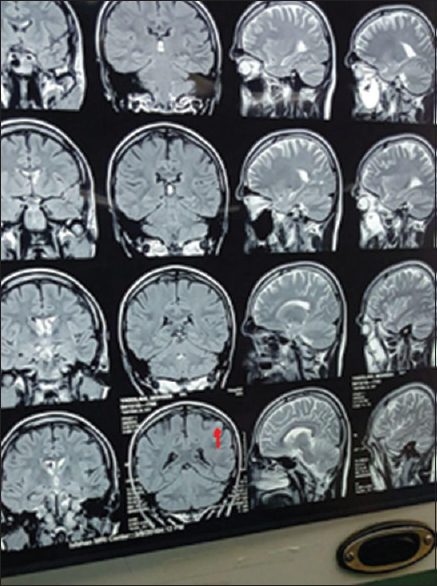 An awake craniotomy in a 30-year-old man was conducted using a scalp block, dexmedetomidine, and remifentanil infusion without any airway device throughout the procedure. Dexmedetomidine administered at a loading dose of 1 μg/kg and maintenance dose of 0.2–0.7 μg/kg/h. Remifentanil dose was 0.02 μg/kg/min. The patient remained comfortable and hemodynamically stable throughout the procedure. Cortical electrical stimulation revealed motor cortex overlapped with seizure focus. So that surgical procedure was limited to subpial resection of the epileptic focus. Dexmedetomidine with concurrent scalp block appears to be an useful sedation for awake craniotomy when sophisticated neurological test is required. Awake craniotomy for resection of lesion near the eloquent cortex of the brain is necessary to reduce the risk of permanent neurological deficit during surgeries for epilepsy, brain tumor, and movement disorder. The patient was a 30-year-old opium addict man. The patient presented with complex partial seizure since 6 years ago and was noted to have persistent seizure despite an adequate trial of anticonvulsant therapy. 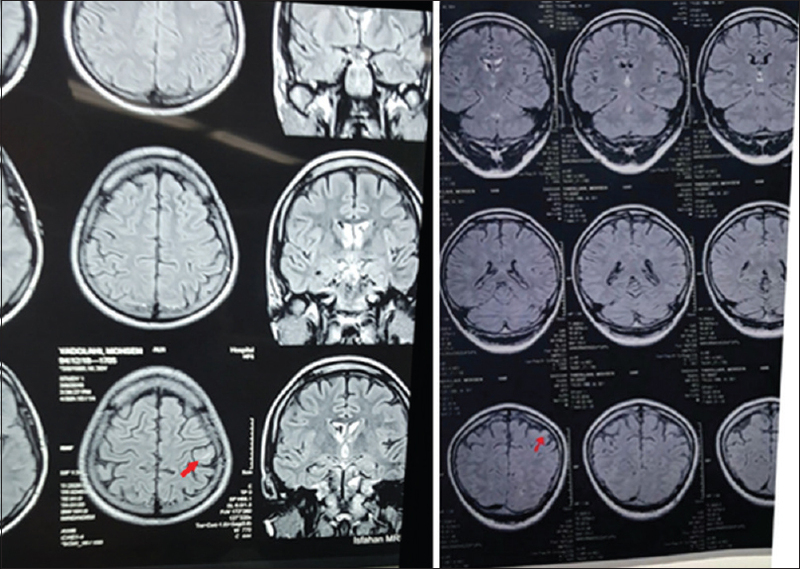 The magnetic resonance imaging demonstrated a hypersignal small lesion in the left precentral frontal lobe suspicious for sclerosis [Figure 1] and [Figure 2], and electroencephalogram was concordant with seizure activity arising from this region. Because of lesion location within frontal lobe adjacent to primary motor cortex, an awake craniotomy was deemed to be the safest approach. The patient was recommended to consume opium at habitual dose till the day before surgery. At surgery day, 10 mg morphine was given to the patient intravenously before operation started. Internal Foley catheter is inserted and fixed. Six scalp nerves were blocked bilaterally with a mixture of bupivacaine 0.5% with epinephrine (1/200000). After 5 min, the patient's head was positioned and fixed using a three-pin head holder (Mayfield). The patient was turned to right lateral decubitus position and was monitored with a noninvasive blood pressure (NIBP), IBP from right radial artery, pulse oximetry, capnometry, and electrocardiogram (ECG). The patient was oxygenated through a face mask (6 l/min) after that, dexmedetomidine infusion stated (1 μg/kg as loading dose and 0.5 μg/kg/h as maintenance dose) with remifentanil infusion (0.02 μg/kg/min). Hypertonic saline 5% was infused to the patient (5cc/kg) before bone flap removal. Location of the lesion was mapped out on the scalp and left frontoparietal paramedian craniotomy was done. Dura was opened after injection of local anesthetic. After detection of seizure discharge by electrocorticography, direct electrical stimulation using bipolar electrode was performed. Cortical electrical stimulation revealed region of cortex that exhibited right upper extremity motor overlapped with the seizure focus, so the patient was asked to flex and extend and also abduct and adduct his right upper extremity to avoid harm to any eloquent area during subpial resection of the epileptic focus. During skin closure, dexmedetomidine and remifentanil infusion were stopped. At the end of the procedure, the patient exhibited no neurological deficit. The patient remained hemodynamically stable and completely awake and cooperative throughout the procedure. The patient was transferred to Intensive Care Unit and discharged on the second postoperative day. Awake craniotomy allows surgical resection of epileptogenic focus while monitoring for neurologic damage. Absolute contraindication to this technique is an uncooperative patient. Preoperatively, anesthesiologist should consider age, maturity, anxiety, claustrophobia, degree of intracranial pressure, history of reflux, nausea and vomiting, and previous seizure therapy. Airway assessment is important for emergent general anesthesia  and endotracheal tube, laryngeal mask airway, and other supraglottic airway device should be available. Lateral- or semi-lateral positioning is commonly used to allow the patient comfortable time and provide ideal patient access to anesthesia team during the surgery. Tenting of surgical drapes upward from the patient on the site of the anesthesia team provide an area of access and may also reduce the patient's sense of claustrophobia. The patient is monitored by ECG, IBP, NIBP, pulse oximetry, and capnometry. Internal Foley catheter is fixed before procedure started. One of the infrequent complication during awake craniotomy is intraoperative seizure that started by cortical stimulation and aborted by stopping the stimulation or delivering ice-cold saline, directly onto the cortical surface. All patients who might benefit from awake neurological examination during surgery should be considered for awake craniotomy. Careful patient selection for operation and the use of scalp block and best choice of anesthetic agent and clear communication between members of the patient's care team will minimize many potential complications and improve patient outcome. Sheshadri V, Chandramouli BA. Pediatric awake craniotomy for seizure focus resection with dexmedetomidine sedation – A case report. J Clin Anesth 2016;32:199-202. Erickson KM, Cole DJ. Anesthetic considerations for awake craniotomy for epilepsy. Anesthesiol Clin 2007;25:535-55, ix. Sagher O, Herrey-Jumper SL. Awake craniotomy and intraoperative neurological decline. In: Mashour GA, Farag E, editors. Case Studies in Neuroanesthesia and Neurocritical Care. 1st ed. New York: Cambridge University Press; 2011. Bekker AY, Kaufman B, Samir H, Doyle W. The use of dexmedetomidine infusion for awake craniotomy. Anesth Analg 2001;92:1251-3. Souter MJ, Rozet I, Ojemann JG, Souter KJ, Holmes MD, Lee L, et al. Dexmedetomidine sedation during awake craniotomy for seizure resection: effects on electrocorticography. J Neurosurg Anesthesiol 2007;19:38-44.